Frodo Waits for Sam Across the Sea ~ FotR screencaps, poem, art. There is no canon material that portrays Frodo’s experience in Tol Eressea across the Sea. In Letter #246, Tolkien described it as a sort of good experience for him. This famous letter was written thirteen years after Tolkien had finished writing LotR (LotR was submitted for publication in 1950, but was not accepted at once; RotK was not printed until 1955). He would have had plenty of time to mull over what he meant and didn't mean in the book that had engrossed him. 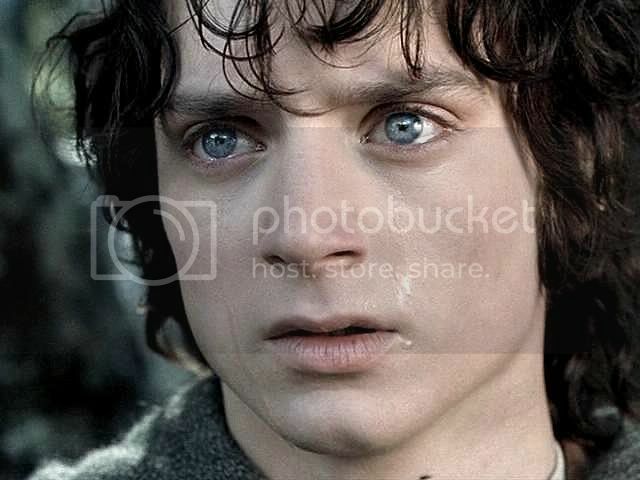 Frodo was sent or allowed to pass over Sea to heal him – if that could be done, before he died (…) So he went both to a purgatory and to a reward, for a while: a period of reflection and peace and a gaining of a truer understanding of his position in littleness and in greatness, spent still in Time and amid the natural beauty of ‘Arda Unmarred’, the Earth unspoiled by evil. Frodo needed a hobbit’s companionship. His creator said so. But although Tolkien said Frodo loved Bilbo best: his mentor, grown-up friend, fellow-scholar and appreciator of the finer things, not to mention surrogate parent, he certainly loved Sam, too. 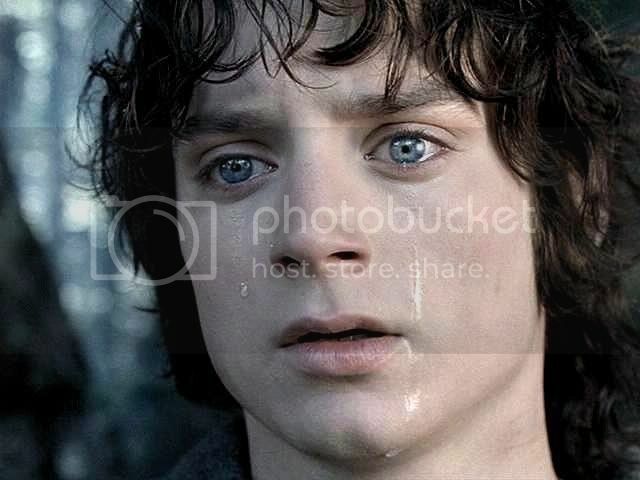 Frodo had gone through things with Sam he’d not gone through with anyone else, and Sam had stuck by him. Like Frodo, Sam had seen beautiful things and terrible things. Terrible things like the plain or Gorgoroth and Shelob's tunnel, but, more importantly from Frodo's point of view, terrible things Frodo thought he'd done -- and been. It was Sam, then, perhaps even more than Bilbo, who was specially suited to help Frodo through whatever he needed to get through in his “purgatory”, learning his position in both his littleness and greatness. “Friend of friends”, Frodo called Sam. Whether one reads that as meant the way Tolkien no doubt meant it (as a platonic regard) or as slash, it’s a strong confession of attachment and esteem. Before the Quest, although Frodo and Sam appeared to be long-acquainted, regarding each other with friendliness (and, perhaps, a degree of hero-worship from Sam's side), they did not seem to know each other very well. They were not intimate. That would come in the trenches. The unbreakable bond that was forged between them was forged in shared experience: of wonder and beauty, fatigue and privation, struggle and suffering; surviving against all odds. Therefore, however healing and beautiful were the Undying Lands -- however gracious, kind and loving his friends there -- it seems to me that Frodo would still miss Sam. [A] couple of times this week I've caught the middle of a radio story about a Viet Nam vet, and what he went through after he came back in terms of PTSD, and bad memories. He said that when he first came back his friends would has "what was it like?" and he'd tell them things. Too many things, details they didn't want to hear and that he himself had a hard time living with. Soon his "friends" didn't come around anymore. He felt different than everyone else, and became quite isolated for more than two decades. Happily, he eventually found his way out - partly through making contact with other vets on the net. I am sure that while Frodo was still at Bag End, Sam and Frodo were a help to each other the way ms_banazira suggests Merry and Pippin were at Crickhollow: two intimate friends who had been through much together, with whom they could share and process what had happened. Folk were not interested in hearing the tales of the four Travellers, especially Frodo’s, Tolkien wrote. Hobbits were said habitually not to dwell on dark things (unlike us moderns), but to press on with what cheer they could muster, putting it behind them. Yet there are many ways to “talk” about shared negative experience, ways without words. It could be as subtle as Merry passing Pippin in the parlour, noticing his younger cousin standing stock-still, staring glassy-eyed into the reflections on the window pane. Was it the Palantír? Visions of Denethor burning in the pyre? An exchange of glances would confirm it (or not), and a sense of mutual understanding would be reached. A nod and a smile, a press of a shoulder would deliver the consolation and encouragement needed. Or Merry would be laughing over some tale of life as the smallest adult in Edoras, look at his pipe from Théoden and burst into tears. Pippin would not need to ask why his friend wept. The same with Frodo and Sam. Even if Frodo did most of his talking in words to a sheet of parchment with a pen, there would be all those little moments. If Sam should crush a spider crawling across the tiles with unnecessary vengeance, a shared look would tell all: I know. If they overheard farmers at the Ivy Bush speaking of the King, speculating whether they need pay any mind to his edicts (“Who is he when all’s said and done? Some ranger-fellow!”) – if Took cousins at a Lithe fête laughed that their ancestor had bedded a faerie wife, too, so what did the King have to brag of?, Frodo and Sam would be able to stifle their indignation, roll their eyes at each other and shrug. And if they stood before the mallorn on the Party Field, each would know that the other saw not just the graceful sapling rising before them but the towering trees of Caras Galadhon, and heard the singing of the Elves in the flets unseen above, and felt the breezes of Lórien fragrant and soft on their faces. 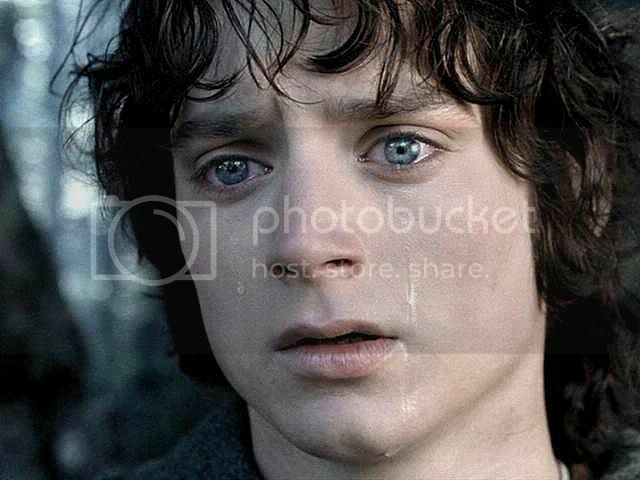 Yes, I am sure Frodo missed Sam not only for his hobbity company, but because Sam was Sam, and what they shared. 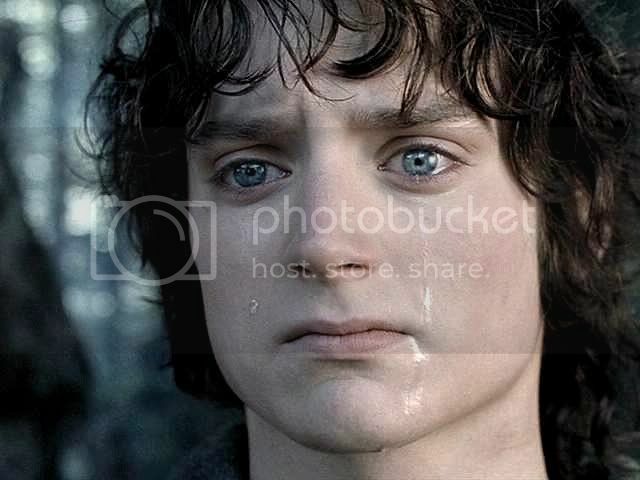 If Bilbo died early on, leaving Frodo without any hobbit company at all, all the more would Frodo yearn for Sam’s companionship. Whatever fans think about the nature of Frodo and Sam’s relationship – whether they were each other’s “friend of friends” or “lover of lovers” or both – any fan would agree that their relationship was bound by love that sprang from shared intense experience, which they shared with no one else. 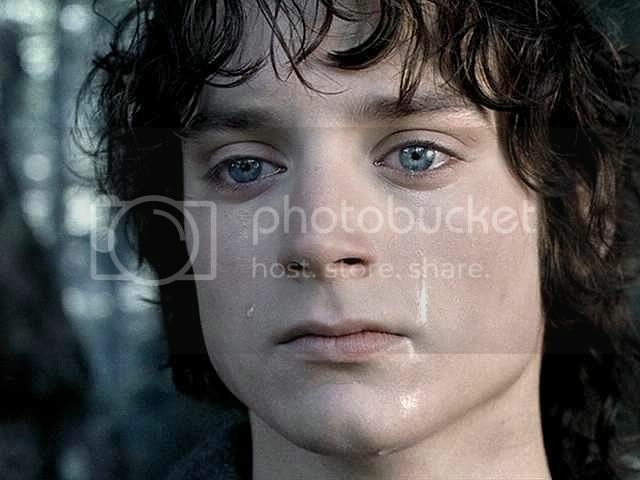 Frodo, with few truly close companions in his home across the Sea, perhaps would miss Sam more, anticipating his coming one day with real longing. Jan-u-wine’s short prose piece, Soon, acutely listens to Frodo’s heart and thoughts as he anticipates Sam’s coming. For illustrations, I turned to the scene in which Frodo makes his decision about going on along on the banks of the Anduin, from FotR. His face in these scenes express many subtle nuances of feeling. I thought they would do very well. He does not know what year it might be, the woven skein of time being no longer something he counts nor considers. Somehow, when the season has danced from puff-clouded spring to clear-sky'd summer, days moving the sun in almost sullen cadence, somehow, he feels disquieted, the dull stab of a sorrow either buried, or not as yet perceived, worrying the edges of his dreams. Only colour, they were, colour, or the horrified lack thereof, as if all the world had fallen into to a void wherein nothing might live. Sound. A thin keening that he did not remember upon waking, an echo of grief balanced upon the very edge of hearing. walking, so that he might not dream. And in the walking, in the wheeling of the stars and the sun, in the rain that fell without warning, joining its grey life to that of the Sea, he knows, of a sudden, the year-day it must be, and a cloud of feeling claims him, joy and muted pain striving equally within. And he sees it, sees Home, sees the Harvest, all brought in and settled away, neat, as would be a Gardner's wont, sees the journals, final pages writ with a large, square, careful hand and placed upon a dustless shelf, sees the familiar pack and stick and the pony waiting beyond the door. There is a lad there, a lad he does not know, a lad weeping and fastening a soft-woven grey cloak about aged (yet unbent!) shoulders. And he sees (yet does not hear) the lad's name fall from lips struggling with a smile, fast-followed by an embrace whose ferocity he knows well. And the stars and the sun wheel by again, mere glancing light upon the great time-river. Overcome by all he has seen, felt, *heard* in the seeming space of a moment, he falls to sleep upon the salt-laced strand, empty crab-cases and bits of gem'd sea-weed lying close about him, retreating tide weaving half-circles in the drying sand. He remembers, and the confusion of images straightens itself, clears to curved clarity, moment cascading to moment, like the visions he saw long ago within the Lady's mirror. A garden, the scent of the Sea mingled with roses, and a lass, gold hair threaded by grey. Another farewell, a crimson book passing hand-to-hand, smiles leavened by salt. The sharp-soft clip of hooves, the silver'd half-moon of the harbour, guardian cliff-walls and horizon rose-gold with sunset. The tide, running swift and cold and green-grey along a near-empty quay. Unsteady feet upon an upward-climbing plank (and he can feel them, now, feel them, as if they were his own, feel the uncertainty and a heart divided, even at the last). A final glance behind, then a roughened hand upon a roughened rope, and mistrusting toes gripping a gently rising deck. And he had not recalled, til now, just how this journey might be, not recalled the wind, strong and sweet, filling hearts and sails with studied ease, nor the Song growing as orange-pink sky gives way to sheeted night. He had not recalled, either, the great silence which fell, sudden, yet not fearful, (as such silences might be), but full of misted waiting, like the moment between the birthing of a babe and its first knowing cry. And he bows his head, listening as the Song creeps back into the silence, weaving itself within the gaps and spaces there, pausing and starting and pausing again, notes and phrases and silences turning with and upon each other, and ending with a quiet which still bespeaks them all. Soon, he knows (though "soon" in this place is only a word he uses to hold separate that which has not happened from that which *has*), soon, there will be a sail, dipping white upon the bright blue diamond of the Sea. ~ “Gulls”, by Justin Cherry.. Previous screencap entry (“Sam Grieves by the Shore” ~ caps from FotR, jan-u-wine's "Not So Easily Mended) HERE. Next entry ("A Life Remembered" ~ caps from the Grey Havens, "A Sailor's Quest" by jan-u-wine) HERE. HA! To tell you the truth, elgato_gamgins is a combination of two old pen names. Elgatocat and Perhin Gamgins(a mixture of Peregrin and Frodo and Sam's last names). Thank you! I NEVER would have guessed the answer. I, for one, don't get your username. Me, too: we have three, used to have four. I have one cat. She's a doll-faced Persion. Her face is pointed out instead of being flat like she ran into a wall. Absolutely. It doesn't have to be any more complicated than that. Awwww. A sympathetic woman is what you are, Shirebound. Those beautiful caps fit perfectly with the words of Jan-U-Wine. Yes, this could be Frodo waiting for Sam across the Sea. Lovely and very touching! It's a beautiful piece, I agree. Not poetry, but with much poetry in it. Jan-u-wine writes Frodo in a way that I feel as though I am reading about Frodo in LotR, but on the inside, if that makes any sense. thank you so much for this, for the screencaps (what can I say to add to such beauty? 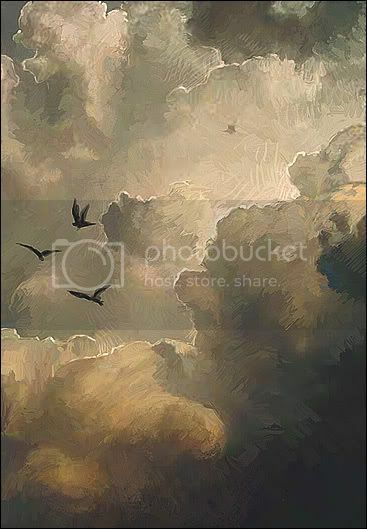 ), to the poem... which is pure jan-u-wine, meaning it is deep and lovely and full of meaning, and also the beautiful "Gulls" painting. What a heady combination! And I enjoy SO much Mechtild's commentary. 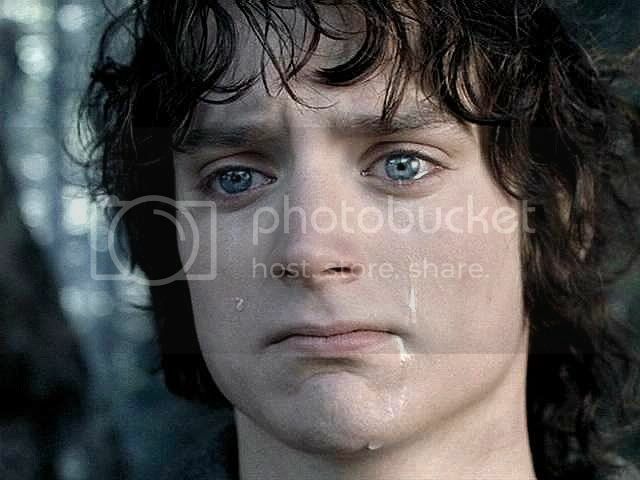 I also happen to agree that Frodo would miss Sam terribly and would look forward so very much to his arrival. ...in the rain that fell without warning, joining its grey life to that of the Sea, he knows, of a sudden, the year-day it must be, and a cloud of feeling claims him, joy and muted pain striving equally within. ...fast-followed by an embrace whose ferocity he knows well. ...he falls to sleep upon the salt-laced strand, empty crab-cases and bits of gem'd sea-weed lying close about him. ... great silence which fell, sudden, yet not fearful, (as such silences might be), but **full of misted waiting**, like the moment between the birthing of a babe and its first knowing cry. How can we non-poets ever hope to express ourselves as well as this? We can't, but at least there ARE wonderful poets out there in the world who CAN express such things for us. jan-u-wine captures the ephemeral, the things which cannot be caught, and describes them. And M. has captured the beautiful images and put her wonderful thought-full prose to it, and so the rest of us are able to feast on all of it. And you picked out the one about, "the salt-laced strand, empty crab-cases and bits of gem'd sea-weed lying close about him". For me, I don't know why, but the image that calls to mind is pure enchantment. And, "the confusion of images straightens itself, clears to curved clarity, moment cascading to moment" -- oh, you are so right: "masterful" is what it is. You know, of course, that I agree with you about the particular genius of jan-u-wine's writing: she sees, isolates and puts her sensitive finger on nuances no one else gets - or only rarely - and shows how they are keys to understanding the larger picture. I feel so -- now this is going to sound awfully corny, like I'm running for public office in the current U.S. -- *blessed* to have discovered jan-u-wine's poetry. It's more than poetry to me, it's like, I don't know: "fic in-depth". With a few exceptions, it is my favourite Frodo fanfic out there, even though it isn't prose! Thanks again, Mary, for stopping by to comment. I know your time is precious. I feel like telling everyone I know about her poetry, too... but most people I know, even those who READ(ie, fiction/nonfiction) don't read poetry. It does take longer to read/absorb, but it's so worth it!! I enjoy your prose entries greatly as well. Please drop me a line when you post the next one. Thanks! BTW, I have THREE CATS, and we love them to pieces. Even the kitten, who is into everything and really a lot more 'trouble' than the 2 older ones. He can't help being young!... but wow, I think he's using up some of MY nine lives, and I really only feel we have TWO of them, anyway... one here, and one in our true home( heaven). "What you said" on jan-u-wine's gift, and on the reluctance of people to read poetry. I ought to know: I rarely read it myself. People on "The Harem" thread helped re-introduce me to classic works (especially the love poetry). I would never have read jan's work but for a rec on an esteemed fic writer's thread ("abby_normal" on LJ, but a couple of other names as an author of fanfic). Even then, although I thought the linked examples were great, I wouldn't have troubled to enter the alphabetical list of jan's pieces if she hadn't begun corresponding with me. If our conversation reminded her of something, she'd link me a poem. More often than not, I'd be floored bu how excellent and how moving and how *true* they would be. But that's how I had to read them: hand-fed to me, one at a time. I am hoping that my posts do that for people. Let them slow down, take their time, and just read one poem. No need to look at a great big daunting list. Just one poem per entry. I always feel as though I am presenting a jewel, like a crown presented on a velvet pillow at a coronation. I forgot to say, "Oh, but kittens are so cuuuuuuuuuute!" But they can be naughty little scamps. I love them for their cuteness, but am usually more than ready to see it grow up when it is time. I always feel as though I am presenting a jewel, like a crown presented on a velvet pillow at a coronation. Thank you Mechtild for the insightful essay. The images are superb. I'm afraid I don't have the skill, to put into words just how much I love Jan-u-wine's poetry and prose. But I definitely have the capacity to appreciate and be moved by the beauty of her words. You are welcome, Este. Sensitive-minded, warm-natured commenters like you are more than any recompense. Even if we can't be friends in the flesh on account of the miles of ocean between us, you make me feel as though I've got a soul mate in Frodo- , Tolkien- , and jan-appreciation. Sorry to be so lagging behind, Mechtild. Oh my, this has always been one of my favourite scenes and moved me beyond words. Here you have captured shots I have not seen captured before (not having got around to doing this one myself - don't think so, it's so loooonng since I had time to do any capping (like 3 years). 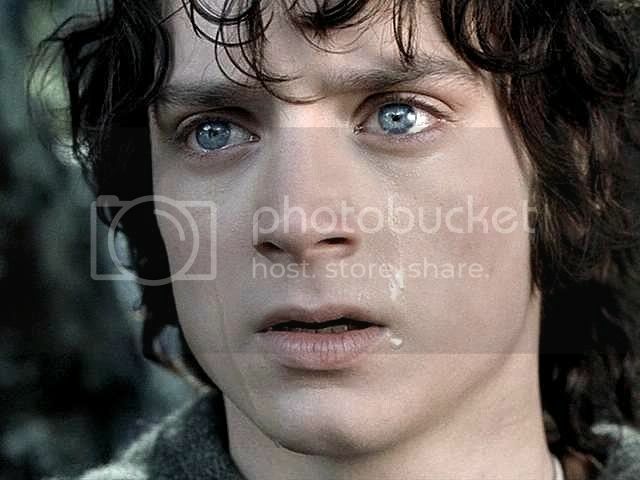 I just adore his face as it goes from sorrow through to determined here, our Frodo's determined look has inspired me much over the last 18 months or so. I think most cappers focussed on the "sorrowful" frames, but I wanted the determined, because they went with the stong hope of the poem better.